Winter 2012 Anime Season ~ Cumulative shows aired by date. 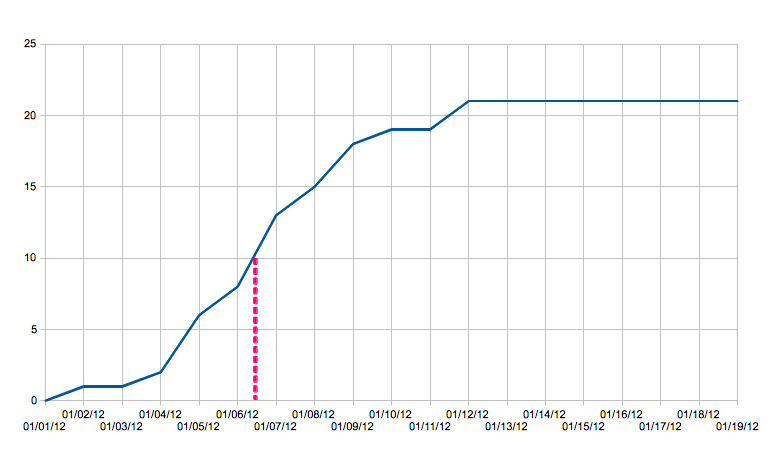 Red dashed line shows approximate point at which half the new shows have already aired (January 6th). You can file this one under what I did while I was waiting for the final episode of Working’!! to download. Including Black Rock Shooter (whose February premiere pushes it off the right of the chart), there are 22 shows starting this season (by my count). The red line shows that the half the shows will have aired by some time on January 6. What can you do with this information? Make this lovely chart. Now, if you’ll excuse me, my download has completed. Speaking of which, what did ya think? I actually thought it was a little flat for a season ending ep. Although I’m probably just bitter because I wanted there to be a little more progress in the Inami/Takanashi relationship. Granted, I knew there wasn’t going to be some GRAND resolution, and he did reafirm his committment, but still…. Aside from that, what a great show. I hope they do a third season, and it doesn’t take ’em years to get around to it. I guess I would say that Working is an okay show, but it doesn’t really impress me. Like you said, there is no real story progression. The humor is based on unchanging characters, so the characters can’t grow nor can the characters develop without blowing the joke. It is amusing at times, but I often get the feeling that it is just the same set of jokes that they have been using over and over since the very first episode. “Working” is very uneven, in that it can go for quite a spell without being noticably funny, but then every once in a while they’ll do something that makes me really laugh out loud — and that’s not too common anymore. Consequently, that’s probably why I like it more than it deserves. If that makes any sense. Humor isn’t my favorite genre anyway. Maybe that is because my hormone levels have dropped as well ^.^ There are other shows I thought were hilarious,though. I’m looking forward to Everyday Lives of High School Boys, because the previews cracked me up. Observation number two: by January 12th, 2012, IT WILL ALL BE OVER. …well, that sounded more ominous than it should’ve been. I can’t decide if I should try to watch the first episode of every show just to experience it, or if I should be more considerate of my personal time. If I do try to “catch them all”, I will be looking forward to it all being over.